Health literacy is an individual’s ability to read, understand and use healthcare information to make decisions about treatment. Health literacy is of continued and increasing concern for health professionals, as it is a primary factor behind health disparities. While problems with health literacy are not limited to minority groups, the problem can be more pronounced in these groups than in whites due to socioeconomic and educational factors. Reading level, numeracy level, language barriers, cultural appropriateness, format and style, sentence structure, use of illustrations, scope of intervention, and numerous other factors will affect how easily health information is understood and followed. The mismatch between a clinician’s level of communication and a patient’s ability to understand can lead to medication errors and adverse medical outcomes. Health care professionals (doctors, nurses, public health workers) can also have poor health literacy skills, such as a reduced ability to clearly explain health issues to patients and the public. The eHealth literacy model is also referred to as the Lily model. This model includes basic literacy, computer literacy, information literacy, media literacy, science literacy, and health literacy. the eHealth literacy model: The eHealth literacy model is also referred to as the Lily model, which incorporates the following literacies, each of which are instrumental to the overall understanding and measurement of eHealth literacy: basic literacy, computer literacy, information literacy, media literacy, science literacy, health literacy. language barrier: A figurative phrase for the difficulties faced when people who have no language in common attempt to communicate with each other. Health literacy: Health literacy is an individual’s ability to read, understand and use healthcare information to make decisions and follow instructions for treatment. Health literacy is an individual’s ability to read, understand, and use healthcare information to make decisions and follow instructions for treatment. Health literacy is of continued and increasing concern for health professionals, as it is a primary factor behind health disparities. While problems with health literacy are not limited to minority groups, the problem can be more pronounced in these groups than in whites due to socioeconomic and educational factors. There are many factors that determine the health literacy level of health education materials or other health interventions. Reading level, numeracy level, language barriers, cultural appropriateness, format and style, sentence structure, use of illustrations, scope of intervention, and numerous other factors will affect how easily health information is understood and followed. The mismatch between a clinician’s level of communication and a patient’s ability to understand can lead to medication errors and adverse medical outcomes. The lack of health literacy affects all segments of the population, although it is disproportionate in certain demographic groups, such as the elderly, ethnic minorities, recent immigrants and persons with low general literacy. Health literacy skills are not only a problem in the public. Health care professionals (doctors, nurses, public health workers) can also have poor health literacy skills, such as a reduced ability to clearly explain health issues to patients and the public. Due to the increasing influence of the internet for information-seeking and health information distribution purposes, eHealth literacy has become an important topic of research in recent years. The eHealth literacy model is also referred to as the Lily model, which incorporates the following literacies, each of which are instrumental to the overall understanding and measurement of eHealth literacy: basic literacy, computer literacy, information literacy, media literacy, science literacy, health literacy. 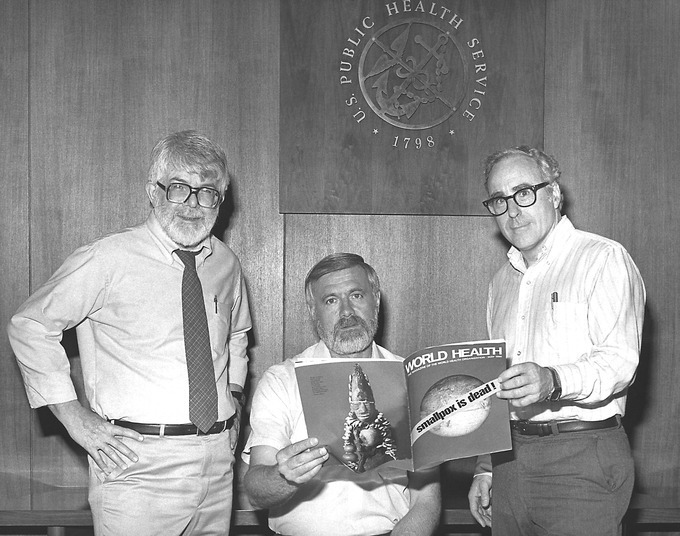 Directors of Global Smallpox Eradication Program: Three former directors of the Global Smallpox Eradication Program read the news that smallpox had been globally eradicated in 1980.